Just Jeeps Smittybilt Pivot Heavy-Duty Oversize Tire Carrier Kit For 2007-18 Jeep Wrangler JK 2 Door & Unlimited 4 Door Models | Jeep Parts Store in Toronto, Canada. 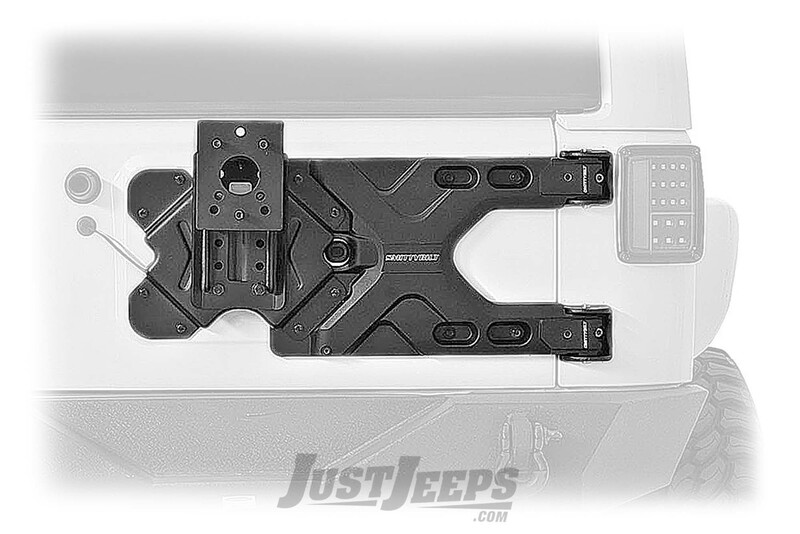 The SRC HD Pivot rear tire carrier is built from very strong monocoque aluminum which helps to eliminate tailgate sag. Fits up to a 37" spare tire, and increases load carrying capacity to 135 lbs. Mounting brackets are made from forged chrome materials which are 30% stronger than steel. Adjustable tire mount and 3rd brake light mount are included. Protective EPDM gaskets are included to protect factory finish. Maintains the easy single action of opening and closing of the tailgate. No drilling is required for installation. Load Carrying Capacity of 135 lbs.